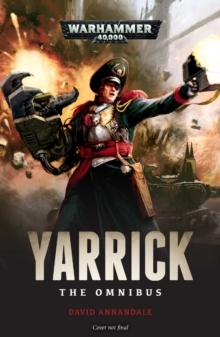 Omnibus of novels and short stories revealing the brutal battles which transformed Commissar Yarrick from a mere man into a legend of the Imperium. Yarrick: once just a name, but now a legend, forged from the blood of the Imperium's enemies. Time after time, Commissar Sebastian Yarrick has fearlessly led Imperial forces to victory beneath black banners of vengeance, even when defeat seemed inevitable. From his early campaigns as a newly blooded officer from the schola progenium ranks, to the brutal battles of the Second and Third Wars for Armageddon, one thing has never changed: Yarrick will not fail. No world will fall to Chaos, heresy or xenos while under his protection. This gripping omnibus contains all of author David Annandale's stories about the famed commissar, and includes two novels, a novella and seven short stories, each revealing the bloody battles that helped forge a legend.